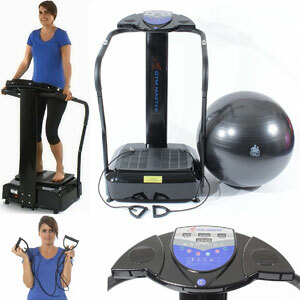 What benefits have users seen when testing out this Gym Master Vibration Plate at home? Starting with the workout, it is clear that there is more on offer here than a typical portable plate might offer. First of all, there is that larger plate that offers movements and vibrations, as normal, for a toning session and improved weight loss. This is part of a much larger machine with handlebars and a tall tower with a console on top. This large console provide settings for an impressive 180 levels of motion and some built-in programmes. Then there is the fact that Crazy Fit vibration plate also comes with power cords and a gym ball to add even more diversity to the workout. The cords add to the tension and range of movement to target key areas. There are lots of people that are impressed with the impact of these motions, with plenty of talk of better posture, muscle tone and more dramatic weight loss than first expected. When it comes to those conveniences and creature comforts, there is a sense of ease of use here and an enjoyable session. Some machines can be a little intimidating but this is more welcoming. The included music system is a nice touch, even if it isn’t especially high end, as is the pump to blow up the gym ball. Are there any clear downsides to this Gym Master Vibration Plate that limit the appeal in any way? There are few negative reviews for this machine because users are so impressed with the quality and the end results. Many minor issues with any settings and the design are overlooked because of their overall achievements. There are a few comments about faulty merchandise, and some that feel that the quality of materials, especially the rubber, could be a little better. Users also cannot overlook the amount of space required for this large machine, but that should be obvious from the sales photos. Summary: what does this mean for a final verdict on this Crazy Fit Vibration Machine ? In the end, there is plenty to love in this 2017 machine and the sense that this up-to-date model provides the very best that the company can offer. It is clear that the designers understand the desires of users when it comes to these plates, as vibration alone isn’t enough. There is a lot going on with this machine that take it beyond a more familiar plate, but not some much that users are scared off. This all means that the Gym Master vibration plate is recommendable to all those looking for the ideal home workout. Find more reviews about the Gym Master Crazy Fit 3900W Peak Power Vibration Machine on Amazon here.